Marianne statue damaged after breakers vandalized the exhibition halls of the Arc de Triomphe, during a brutal mobilization of “Yellow vests” movement. December 1st, 2018. Paris, France. People are celebrating the victory of French team at the football worldcup 2018. Arc de Triomphe, Paris, 15 July 2018. Hungry protestors fist up against the Polices Forces. 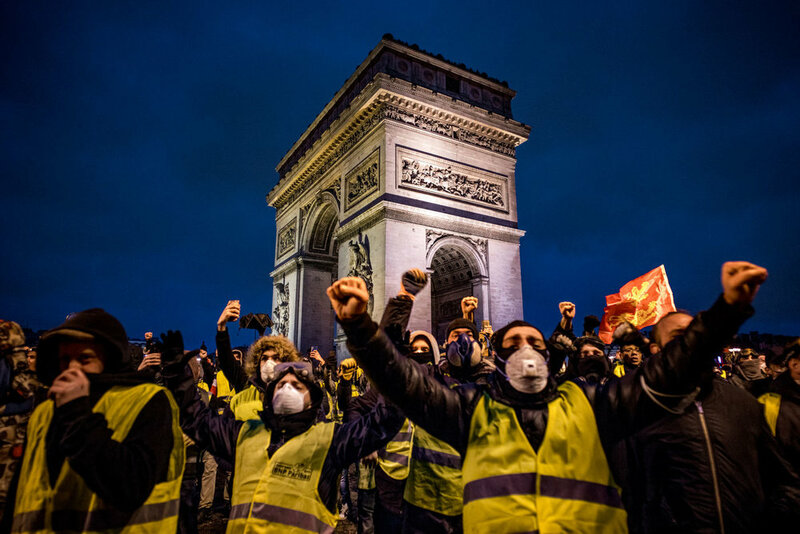 The third episode of demonstration by the "Yellow vests" was brutal in Paris. Arc de Triomphe was degraded, building, shops and vehicles burned at the Place de l Etoile and spread over many streets around. December 1st, 2018 - Paris, France. Les manifestants en colere le poing levé vers les forces de police. Le troisième épisode de mobilisation des "Gilets jaunes" a été brutal à Paris. L’Arc de Triomphe a été dégradé, des bâtiments, des magasins et des véhicules incendiés sur la place de l’Étoile, les casseurs détruisants encore sur les rues et avenues alentours. 1er décembre 2018 - Paris, France. On the night of 8 to 9 November 2016 Donald Trump won the presidential elections and became the 45th President of the United States. Here, the result of Trump victory just appear on the tv screen. November 9, 2016 - Washington DC, USA. 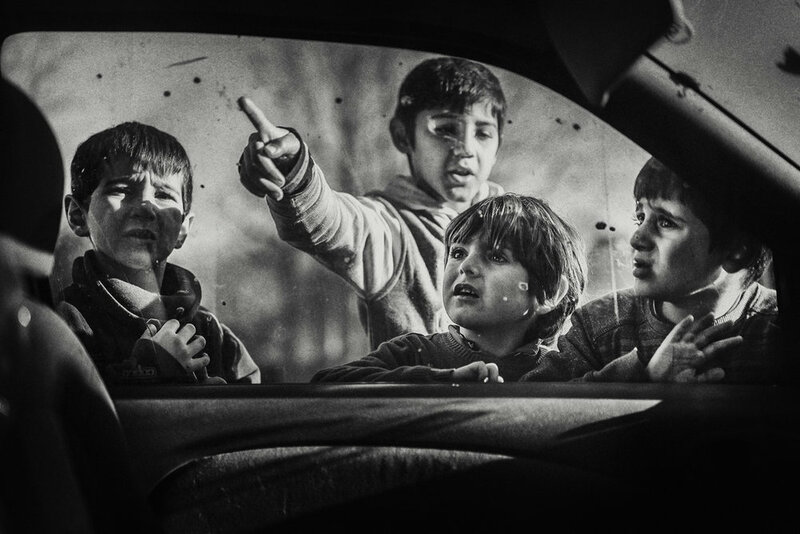 Children gathered at the window of a car, in a refugee camp in north of France. December 04, 2015 - Grande Synthe, France. 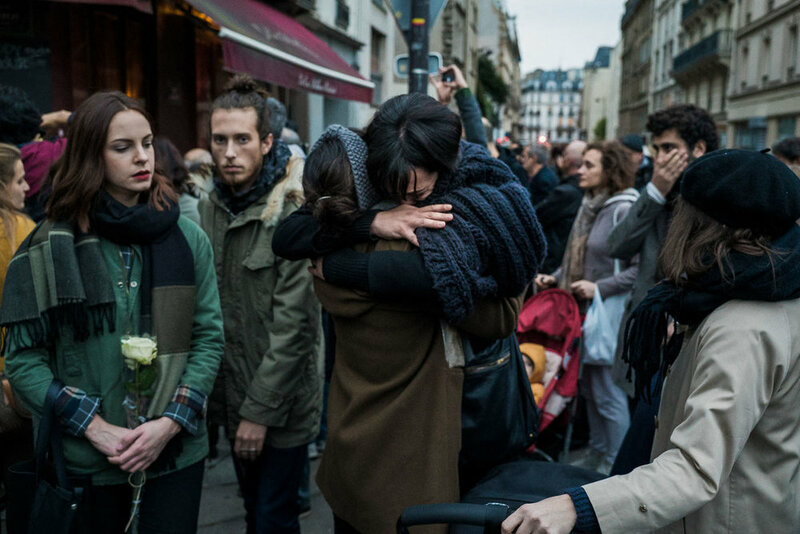 Two women burst into tears between restaurants Le Carillon and Le Petit Cambodge after the shootings that cost the lives of 130 people. November 14, 2015 - Paris, France. Donald Trump just won the presidential elections and became the 45th President of the United States. But a part of the population is rising up against this election. Here is an overview of the days after this contested election. November 8, 2016 - Washington DC, USA. Police has gased some demonstrators in front of Odeon Theater during the demonstration against the Labour's Law of El Khomri, Labour Minister of France. April 25, 2016 - Paris, France. On the sidelines of the Police demonstration against anti- cop hatred, a wild demonstration led by 300 against demonstrators denouncing police violence occurred in Republic Square. A small group then burned a police car along the Canal Saint- Martin, with a Molotov cocktail after him out of power the two policemen who were in the vehicle. May 18, 2016 - Paris , France. A street covered with debris and bricks following the earthquake of April 25th. On the ruins of an old building, a man and a young boy are sitting waiting. 05 May 2015 - Kathmandu, Nepal. A passerby stops on a flooded road in Seine bay, the Voie Georges Pompidou, following historical rainfall for the month of May. May 31, 2016 - Paris , France. Thousands of Cubans chant slogans in homage to Fidel Castro, supporting Raul Castro and demostrating their patriotism, waving flags and portraits of the father of the Revolution. At the end of the 9 days of national mourning decreed after the death of the father of the Cuban Revolution, late Fidel Castro, a ceremony of homage punctuated with speeches was held Place of the Revolution with the presence of many heads of State. December 3, 2016 - Revolution Square, Santiago de Cuba, Cuba. Begun March 31, 2016 , many people were still present Republic Square on the night of sunday, April 10, for Night Stand symbolically dated on March 41. A dummy of the prime minister during F.Hollande presidential, suspended on the Republic statue of Marianne. April 10, 2016 - Paris, France. Portugueses are celebrating the victory of their football national team at the Euro 2016 competition which occured in Paris, just after the after the final whistle. July 10, 2016 - Paris, France. People waving the special issue of Humanity, a rose, pencils, and chant the slogans of tribute to the victims and slogans of hope, during the Republican march following the attacks of January 7, 2015 at Charlie Hebdo, Place of the Republic. January 11, 2015 - Paris, France. On April 25, 2015, Nepal is hit by a massive earthquake of magnitude 7.9. May 12, 2015, a powerful new aftershock hits the country. In total: 8500 people lost their lives. While Kathmandu, the capital, seems almost to have been spared, in the camps or on the ruins, between humanitarian assistance and unsuccessful, little by little, life begins again. May 10, 2015 - District of Gorkha, Nepal. Early evening, a performance has to be canceled at the Comédie Française because of the investment of several dozen protesters, as intermittents and casual workers to influence negotiations about unemployment insurance. During this occupation, intermittents tried to hang a banner from the roof of the French comedy before finally hanging it a little lower on the facade. Comedie française. April 26, 2016 - Paris, France. A rat just feel the TNT trapped in a mine. It stops, sniffs the ground and air (as if to drive the smell before putting it again). The muzzle toward the buried explosive, it is about to scratch the ground, signaling the presence of the mine underground. March 11, 2016 - Siem Reap, Cambodia. A couple kiss in the early morning on a bench at Republic Square, around a tide of shoe during the installation of Avaaz in response to the ban on walking for the climate. November 29, 2015 - Paris, France. France inaugurates new president: Emmanuel Macron, 39. His 1st day as the 8th President of the Republic of France. The Ceremony on the Avenue of Champs Elysees. May 14, 2017 - Paris, France. La France célèbre le nouveau president de la republique : Emmanuel Macron, 39 ans. Son premier jour en tant que 8eme president. Cérémonie sur l Avenue des Champs Elysees. May 14, 2017 - Paris, France. At the arch of Triumph in Paris, where the Place was renamed Place of the two stars, people are celebrating the France team victory at the Russia 2018 FIFA World Cup, after their team scored a 4-2 victory over Croatia. July 15, 2018 - Paris, France. Au pied de l Arc de Triomphe, ou la Place de l Etoile a ete renommee Place des deux etoiles, les francais celebrent a Paris la victoire de l equipe de France a la Coupe du Monde de Football 2018 en Russie, apres s etre imposee 4-2 contre la Croatie. 15 juillet 2018, Paris - France.